Experienced marketers say that you feel like you have exhausted your brain from generating new promotional ideas, you are free to unearth the most ancient ones and re-introduce them to the younger crowd. Yet, this tip only works for the influential companies out there. For the not-so-influential companies, your advertising products will do better if they get improved. 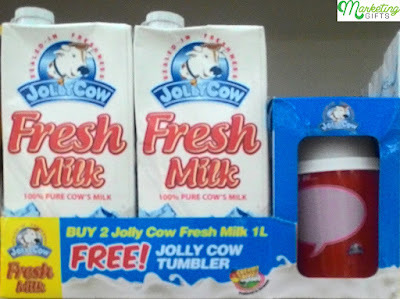 Spend some time scrutinizing this tumbler from Jolly Cow. What are the profitable factors of the GWP? The Logo. The brand’s cow logo is noticeable on one part of the promo gift. Admire how they did not bother much with text and focused on the image of an animal even on the milk carton, because this is the right way to advertise your brand to kids. The Design. Since children are Jolly Cow’s target market, the contrasting white and red colors of the free tumbler catch their interest. It can reflect nicely on their monthly sales, for sure. The Thought Bubble. Parents are very affectionate to their babies these days. If they have kids who are starting to read, they can use this bubble on the gift with purchase to write short love notes for them every day with the aid of a washable marker. Feel liberated to discover other on-pack promotion stuff at the Marketing Gifts blog.